Excerpt from U.S. Coast Guard “Proceedings of the Marine Safety & Security Council” magazine. A tabletop exercise enacted in Sitka, Alaska, uses a gaming board to bring realism to the exercise and take into account the capabilities of the ship and response elements in relation to their actual locations, weather, and response capabilities. During this exercise, participants play out the scenario in turns that represent one hour of actual time. Realistic complications are incorporated into the rules of play. 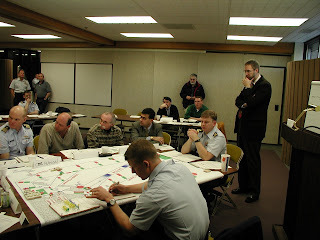 The gaming concept, which was developed in 2001 by Mr. Thomas M. Deely and Mr. Cecil McNutt at the Coast Guard 17th District in Juneau, Alaska, allows participants to see the evolving results of their combined actions to answer such questions as “How long is it going to take to get everyone to shore?” Participants adjust their tactics as play continues in order to improve the final outcome. The scenario pictured shows participants conducting a tabletop exercise in which a cruise ship grounds on Vitskari Rocks, just outside of Sitka, Alaska. Navigation channels are depicted with one nautical mile movement spaces. Green and red boxes were used to track hourly resource movements (i.e. each turn, assets move from green to red to denote turn completion). Granted face to face tabletops do have some value but when will the Government utilize technology to achieve better and faster results for less money?